In addition to wedding and baby gifts, Simply Charming also provides the same charming designs for religious gifts and accessories. These beautiful accessories are designed to help one appreciate the special occasions surrounding their faith. We offer items for baby's first Baptism and Christening, and First Holy Communion. 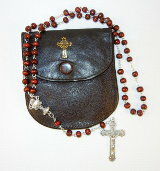 When it comes to our faith, we look for accessories to exemplify elegance and grace. Simply Charming's religious gifts are hand-made with the greatest of care here in the USA and are designed to instill a sense of beauty and godliness.